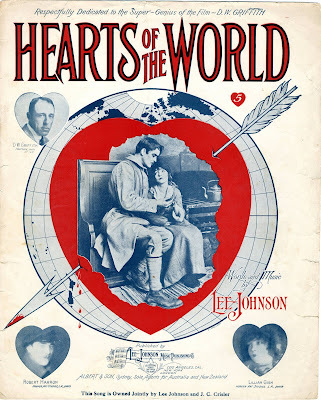 Sheet music to go with D.W. Griffith's WWI drama 'Hearts of the World' (1918). That's the reaction of an audience of about 70 people to 'Hearts of the World' (1918), a seldom-screened D.W. Griffith drama that I accompanied yesterday at the Town Hall Theatre in Wilton, N.H. 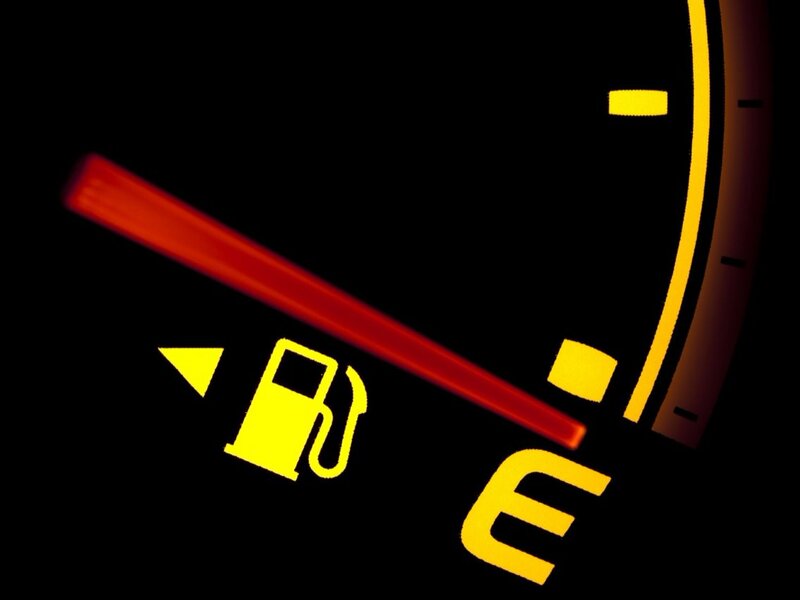 The picture really blew our collective socks off. Really! Like Griffith's other pictures fro the same time, it held the screen and then some. And having both Gish sisters, Lillian AND Dorothy, in major roles, didn't hurt. And an added element of edge-of-your-seat suspense came when I previewed the film just prior to the screening, and the disc we were using (the only one I had) began freezing and pixellating in the climactic final 15 minutes. Youch! I found I could get it to run in a Blu-ray machine rather than the old DVD player I use in my office, but still... At the theater, we really didn't know if the movie would play all the way through, but it did, adding an extra note of triumph. So one more time: Wow! I was wondering if 'Hearts of the World' would work 100 years after its release, and the answer was a resounding YES. It's cut from the same cloth as Griffith's other big melodramas: a story that hooks an audience early, intense emotional confrontations, a thrilling race-to-the-finish climax, and scenes of Lillian Gish losing her mind. As with most of the early Griffith features, it took time to really get going. But once underway, the two-hour picture (short for Griffith at this time) played like a house afire. Our audience applauded, cheered, and reacted strongly throughout. So the question is: why isn't this film more highly regarded? Why isn't it better known? Griffith made it right after 'Birth of a Nation' (1915) and Intolerance (1916), and just before 'Broken Blossoms' (1919) and 'Way Down East' (1920), all acknowledged as among his greatest achievements. I'd have to guess that it's partly due to the reputation of 'Hearts of the World' as a propaganda film. And true, it WAS made at the request of the British government, which allowed Griffith access to the front lines in France. And it's true, the Germans are portrayed as animals, but that's no different from the heavies in other Griffith melodramas. But now, a full century after its release, maybe it's time to reassess 'Hearts of the World.' Maybe it's time to move beyond the textbooks (which largely ignore 'Hearts' anyway) and give it credit for being a prime example of Griffith during his peak as an influential director. I'd never encountered it before. And at yesterday's screening, I asked for a show of hands from those who'd already seen it. Not one! So to our fresh eyes, the film was able to make a very strong impression. Griffith's knowledge of how to structure a story and manipulate the collective emotions of an audience was very much in evidence. Also, it was another example of how difficult it is to know how a silent film will play unless you screen it the way it was intended to be shown: in a theater, on a big screen, with live music, and with an audience. 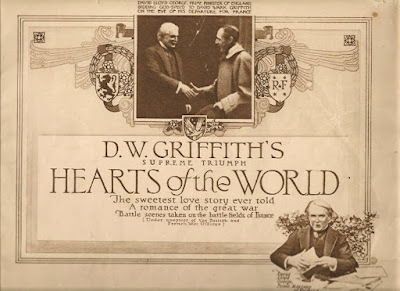 The British connection: D.W. Griffith greeted by British Prime Minister David Lloyd George. So, rediscovery? Well, not solely on the basis of one very successful screening in a small theater in rural New Hampshire, even though quite a few people came up to afterwards to say how much they enjoyed the experience. But I have to say, I would say 'Hearts of the World' holds its own against any of the other big Griffith blockbusters of the era. It has all the ingredients in place to pull along an audience with an inevitability not unlike the ice floe in 'Way Down East' that carries Lillian Gish to the waterfall. If you get a chance to see it in a theater, do so! Just make sure the disc gets checked before the show. This is my final post of 2018, so let me extend thanks to all whom I've encountered this year in the ongoing adventure of creating live music for screenings of silent films. Even as we move further in time from the era when cinema did not include a recorded soundtrack or dialogue, interest in the films from that time continues to persist, and even seems to be growing. 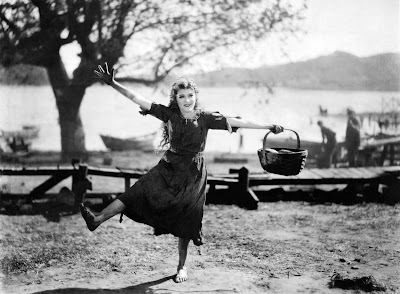 So thank you to all who play a role in supporting and enjoying the art of silent film with live music. Propoganda or good old-fashioned melodrama? Or both? You decide! Back online after several weeks of radio silence. The holidays, you know? And lots of other non-musical things going on. I'll be back at the keyboard in late January with a performing schedule that includes silent film screenings in Topeka, London, and possibly Berlin, Germany. But I do have one end-of-the-year gig coming up this weekend: it's D.W. Griffith's 'Hearts of the World' (1918), a rarely screened drama that I'm accompanying on Sunday, Dec. 30 at 4:30 p.m. at the Town Hall Theatre in beautiful downtown Wilton, N.H. I'm curious about this film, which I've never worked with before. It's right from the middle of Griffith's most period of work: before it came 'Birth of a Nation' (1915) and 'Intolerance' (1916); after it came 'Broken Blossoms' (1919) and 'Way Down East' (1920). I gather a major reason is that it's viewed as a "propaganda" film. And it's true—Griffith made the movie at the invitation of the British government, and it portrays Germans (the enemy!) in the worst possible light. Griffith is regarded as a cinematic pioneer, and rightly so. Bringing length and depth to the American motion picture, his best films (including those above) caused tremendous excitement. More than anyone, he opened people's eyes to the possibilities of this new art form. D.W. Griffith on set with child, hat, and megaphone. But too often, the emphasis is on Griffith's technical achievements: his editing, his camera placement, and so on. These are important, but I don't think they're the major reason for Griffith's impact. What really mattered with Griffith was his ability to construct a story to hook an audience early, and then never let go. That was Griffith's genius. You HAD to see what happened next. That's what sold tickets. More than anything else, that's what made his films so influential. And I've seen it happen again and again. 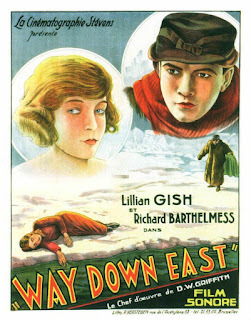 A creaky old melodrama like 'Way Down East' seems almost laughable when viewed alone. But put it in front of an audience (which is how it was intended to be shown) and add music, and even today it snaps back to life. People are on the edge of their seats as the story carries them along with the same inevitability of the ice floe carrying Lillian Gish to the waterfall. Because of his prior experience directing melodrama in small town theatres, Griffith knew in his bones how to grab and audience and keep its attention. And he had to, because if he didn't, people would throw things, or worse. Story-telling mattered. Despite its reputation as a propaganda piece, will the story grab us and carry us along? Will the classic Griffith touch be in evidence? There's only one way to find out, and that's to do what's rarely done: run the picture with live music in theater with an audience. And that's where you come in. 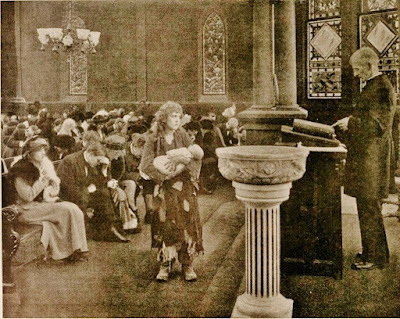 Join us for a screening of 'Hearts of the World' on Sunday, Dec. 30 at the Town Hall Theatre in Wilton, N.H.
A scene from D.W. Griffith's 'Hearts of the World' (1918). WILTON, N.H.—A century-old war drama with scenes shot on location in the actual trenches of World War I is coming to the Town Hall Theatre. 'Hearts of the World' (1918), directed by D.W. Griffith for the British government, will be shown on Sunday, Dec. 30 at 4:30 p.m. The program will be accompanied by live music performed by silent film composer Jeff Rapsis. Admission is free, with a suggested donation of $5 per person to help defray expenses. 'Hearts of the World' stars Lillian and Dorothy Gish, sisters who were among the most popular screen actresses of the era. 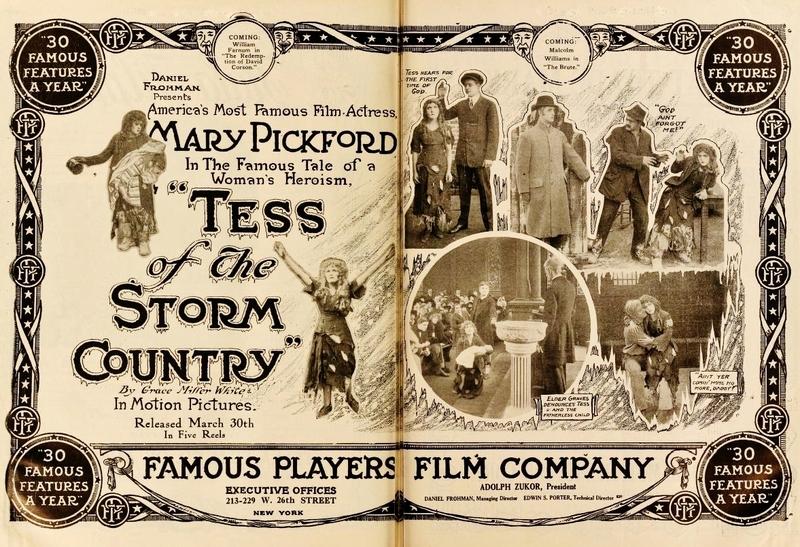 The film is also noteworthy due to its ties to Britain's World War I effort. 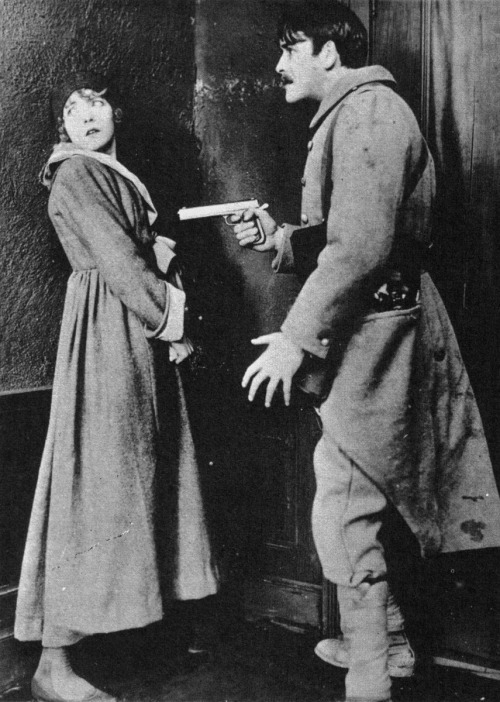 In an effort to change the American public's neutral stance regarding the war, in 1916 the British government contacted Griffith due to his stature and reputation for dramatic filmmaking. 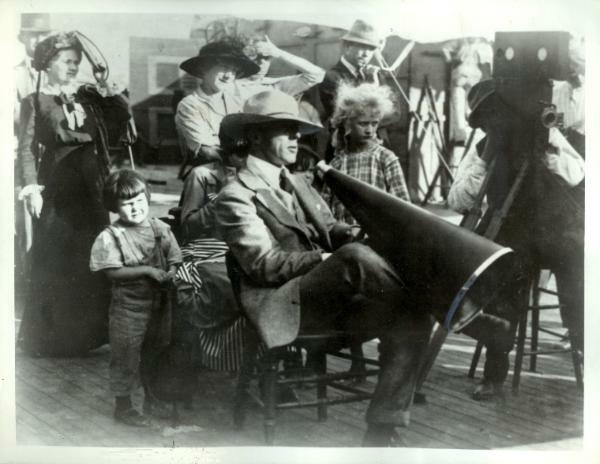 Griffith and several members of his company traveled from Hollywood to Europe, where the war had been raging for three years, to film 'Hearts of the World' on location in England and France. Set in France, 'Hearts of the World' tells the story of a young American man, Douglas Gordon Hamilton (Robert Harron), who lives in a rural French community and is love with local woman Marie Stephenson (Lillian Gish). But their romance is interrupted when World War I dawns, and Douglas decides to join up with the French Army. The Germans then mercilessly bomb and infiltrate Marie's village, and Douglas is injured in battle. As lecherous German soldiers close in on Marie, a recovering Douglas plans a daring rescue. 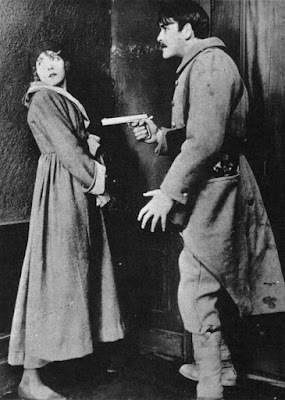 The early scenes are stolen by Dorothy Gish as "The Little Disturber," a mademoiselle of questionable morals who wreaks comic havoc with the allied troops. Dorothy Gish steals a scene in 'Hearts of the World' (1918). 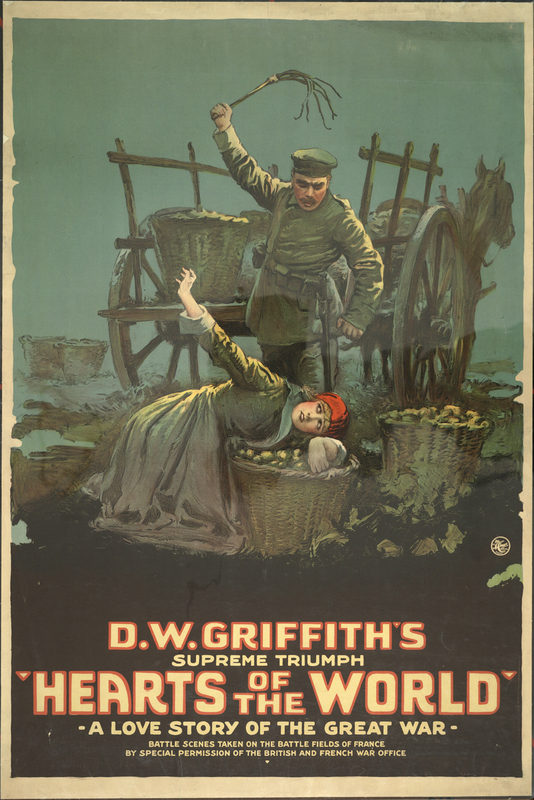 The film, Griffith's third feature-length film after 'Birth of a Nation' (1915) and 'Intolerance' (1916), deliberately portrays Germans as cruel and viscious war-mongers. According to his biographer, Griffith's idea for the story came from reading a December 1915 account of French families driven from their homes by the war. Once in England, Griffith made the rounds, meeting with members of the British War Office and conferring with famous writers such as H.G. Wells and George Bernard Shaw, who supposedly agreed that his best contribution to the war might be "a drama of humanity photographed in the battle area." 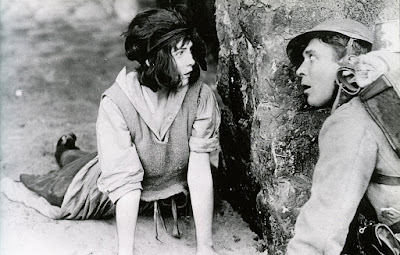 To make 'Hearts of the World,' The British Government gave D.W. Griffith unprecedented access to locations that were otherwise restricted from journalists. 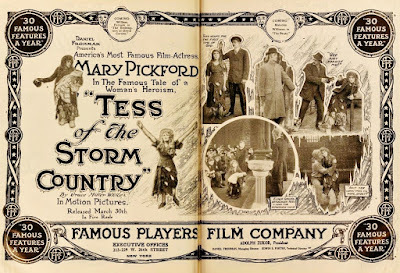 Exterior shots were largely filmed throughout England from May to October 1917. 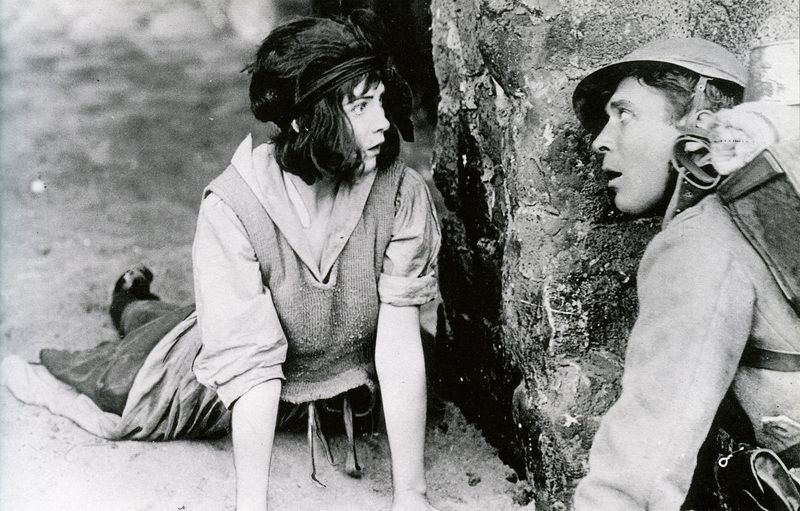 Griffith made two trips to France where he filmed footage of the trenches. In one instance, Griffith and his film crew were forced to take cover when their location came under German artillery fire; he escaped unscathed. The film company then returned to Los Angeles, where British and Canadian troops recreated battle scenes and other interior scenes on a stage. The scenes shot in Europe and Los Angeles were edited together with footage from stock newsreels. On April 6, 1917, events overtook 'Hearts of the World' when the U.S. entered the war while the picture was still in production. 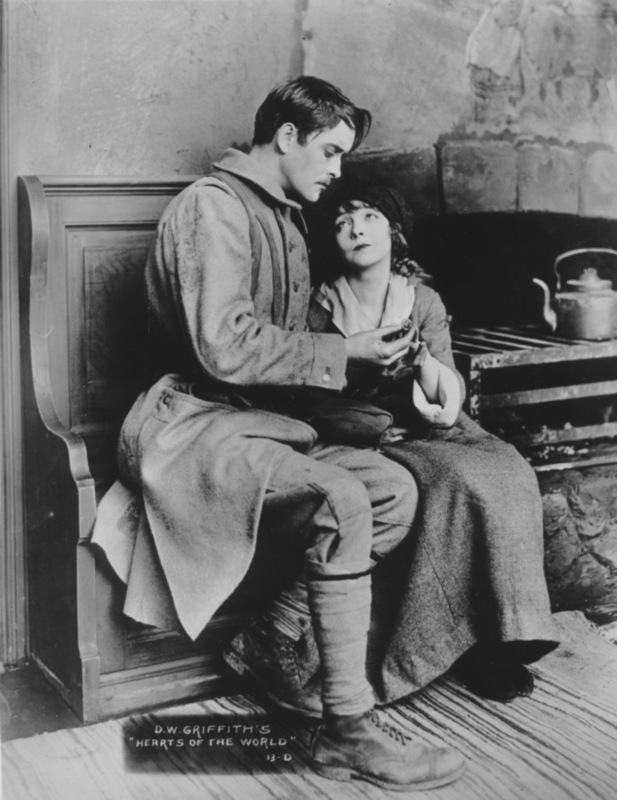 The completed film was released in March 1918, where it found box office success until the war ended with the Armistice of Nov. 11, 2018. In reviving 'Hearts of the World,' the Town Hall Theatre aims to show silent movies as they were meant to be seen—in high quality prints, on a large screen, with live music, and with an audience. "All those elements are important parts of the silent film experience," said Jeff Rapsis, who will improvise a musical score during the screening. "Recreate those conditions, and the classics of early cinema leap back to life. They all featured great stories with compelling characters and universal appeal, so it's no surprise that they hold up and we still respond to them." • Sunday, Jan. 27, 4:30 p.m.: 'The Last of the Mohicans' (1922). The original big-screen adaptation of James Fenimore Cooper's tale about colonial settlers among the Native Americans during the French and Indian War. • Sunday, Feb. 10, 4:30 p.m.: 'The Eagle' (1925). Rudolph Valentino's comeback film is a rousing romp set in Imperial Russia. See the silent screen idol as a soldier who catches the eye of the Czarina, only to desert his platoon when trouble brews back home. ‘Hearts of the World' will be shown on Sunday, Dec. 30 at 4:30 p.m. at the Town Hall Theatre, 40 Main St., Wilton, N.H. Admission is free, with a suggested donation of $5 person to defray expenses. For more information, visit www.wiltontownhalltheatre.com.